This security poster illustrates the PMA-1 Former Yugoslavian Anti-Personnel Mine. This pressure mine uses a plastic clam shell with internal demolition charge. The fuse is chemically initiated when crushed as the clam sections of the body are compressed. This security poster features the description, fuzes, technical specifications, and operation of the PMA-1 Former Yugoslavian Anti-Personnel Mine, a PMA-1, a sectioned UPMAH-1 Fuze, the early wooden box mine PMD-1, and an open PMA-1 with the UPMAH-1 fuze and the 200gm cast Trotyl (TNT) charge. 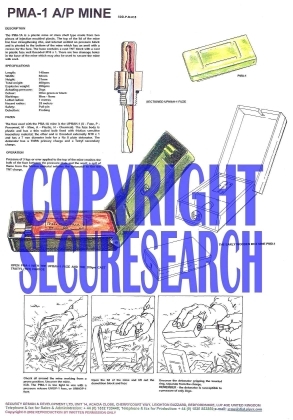 The security poster also contains illustrations and descriptions on how to disarm the PMA-1 anti-personnel mine. The early wooden box mine PMD-1. An open PMA-1 with the UPMAH-1 fuze and the 200gm cast Trotyl (TNT) charge. Illustrations and descriptions on how to disarm the PMA-1 anti-personnel mine. The description, fuzes, technical specifications, and operation of the PMA-1 Former Yugoslavian Anti-Personnel Mine. This security poster features the description, fuzes, technical specifications, and operation of themine, a PMA-1, a sectioned UPMAH-1 Fuze, the early wooden box mine PMD-1, and an open PMA-1, and illustrations and descriptions on how to disarm the PMA-1 anti-personnel mine.